Fifteen-year-old Natalie is obsessed with ballet and plans to spend the entire summer in dance class with her two best friends. But when her mom gets a job out of town, Natalie gets shipped off to stay with cousins she barely knows. Natalie is thrilled when her cousins invite her to join them at the local dance studio. But it turns out it's not a ballet class; it's Irish dance. Skeptical at first, Natalie is surprised to learn she really enjoys the new dance style and agrees to take part in an upcoming competition. But this new passion could result in Natalie having to leave her ballet dreams behind. 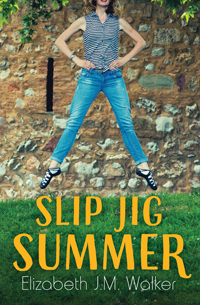 "Slip Jig Summer offers a fun twist on the fish-out-of-water story by putting a ballerina in an Irish dance class. It's a short book with a fast-moving plot…familiar interpersonal issues, portrayed in an accessible storyline, will help lower-literacy readers move through the text easily…I enjoyed the fresh focus on dance and predict the novel will lead its readers to other dance novels (of which there are many). It's an energetic selection for high/low readers." "I love the opening description of the end of year show for the ballet school—it gave a glimpse into what makes someone want to devote herself to such a life."